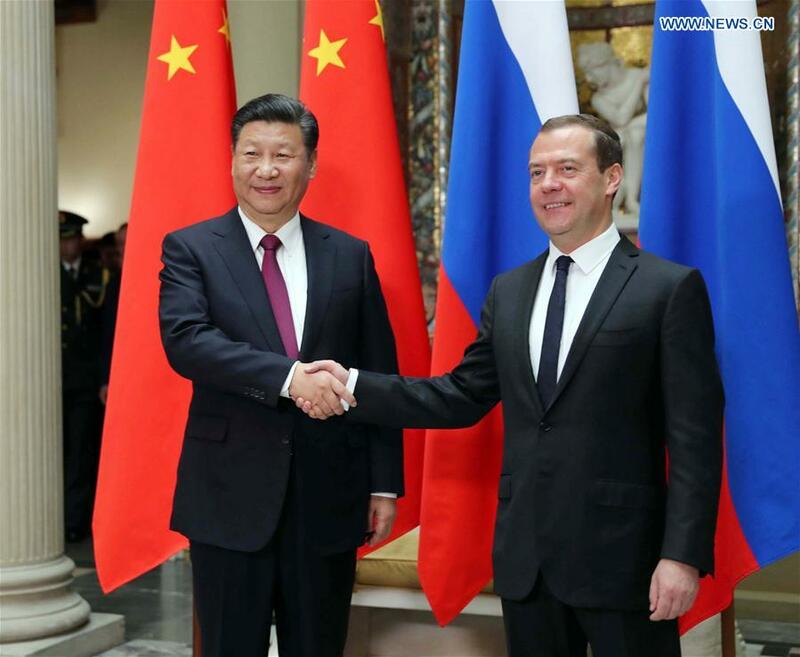 China, Russia agree to jointly build "Ice Silk Road"
MOSCOW, July 4 (Xinhua) -- Chinese President Xi Jinping and Russian Prime Minister Dmitry Medvedev met here Tuesday on expanding cooperation and jointly building an "Ice Silk Road." Noting that Russia is an important partner in the construction of the Belt and Road Initiative, Xi urged the two countries to carry out the Northern Sea Route cooperation so as to realize an "Ice Silk Road," and earnestly implement various connectivity projects. The Chinese president hailed the fruitful results of bilateral cooperation in trade and investment against the backdrop of a sluggish global economic growth and gloomy international trade and investment. China and Russia should continue to support each other, be open to each other and further expand cooperation, so as to create positive conditions for the two countries' common development and revival, and inject strong impetus into world peace, stability and development. For his part, Medvedev warmly welcomed Xi, saying that the two countries' relations are at the best time in history, and the China-Russia comprehensive strategic partnership of coordination serves the two peoples' interests and is also conducive to world peace and development. Recalling that President Vladimir Putin attended the Belt and Road Forum for International Cooperation in Beijing in May, Medvedev said the Russian side is willing to maintain close high-level exchanges, expand cooperation in such areas as trade, investment, finance, energy, agriculture, plane manufacturing, infrastructure and the Northern Sea Route, and carry out major cooperation projects in such areas. Russia is the first leg of Xi's ongoing foreign trip, which will also take him to Germany for a state visit and the upcoming summit of the Group of 20 major economies.